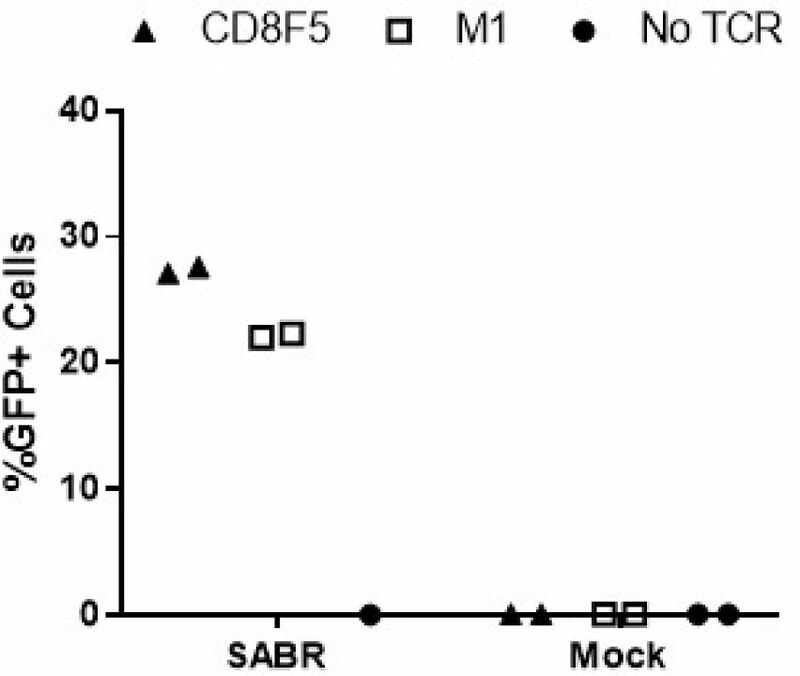 CD8^+ T cells recognize and eliminate tumors in an antigen-specific manner. 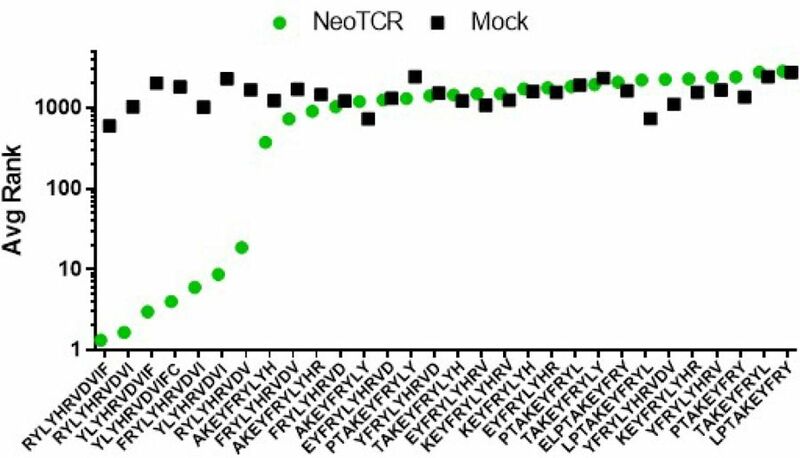 Despite progress in characterizing the antitumor T cell repertoire and function, the identification of target antigens remains a challenge. 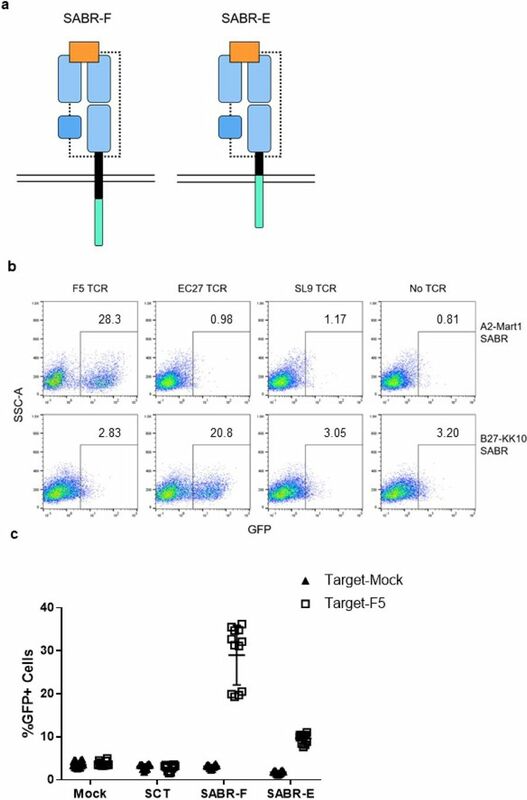 Here we describe the use of chimeric receptors called signaling and antigen-presenting bifunctional receptors (SABRs) in a cell-based platform for T cell receptor (TCR) antigen discovery. 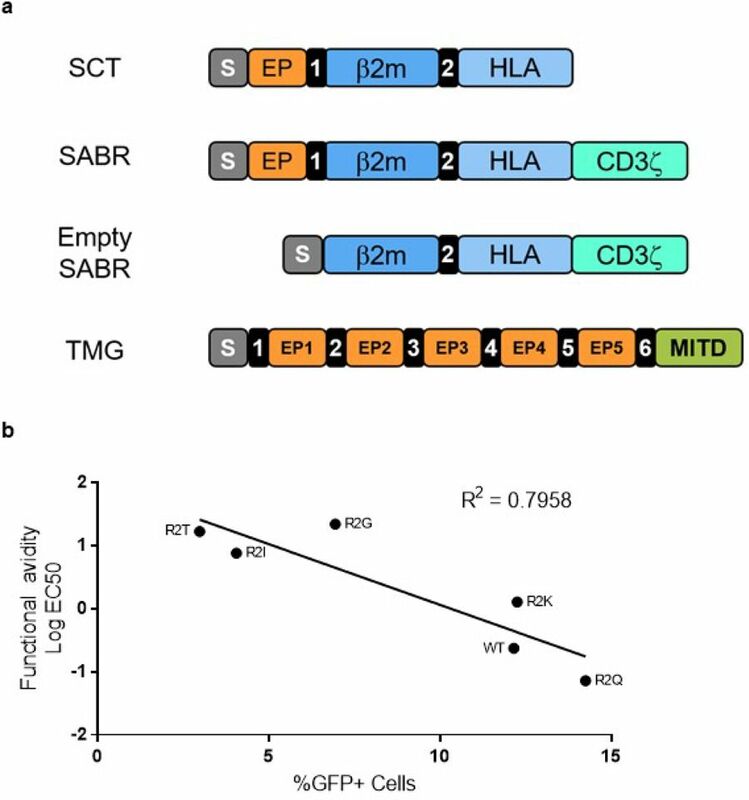 SABRs present an extracellular complex comprising a peptide and major histocompatibility complex (MHC), and induce intracellular signaling via a TCR-like signal after binding with a cognate TCR. 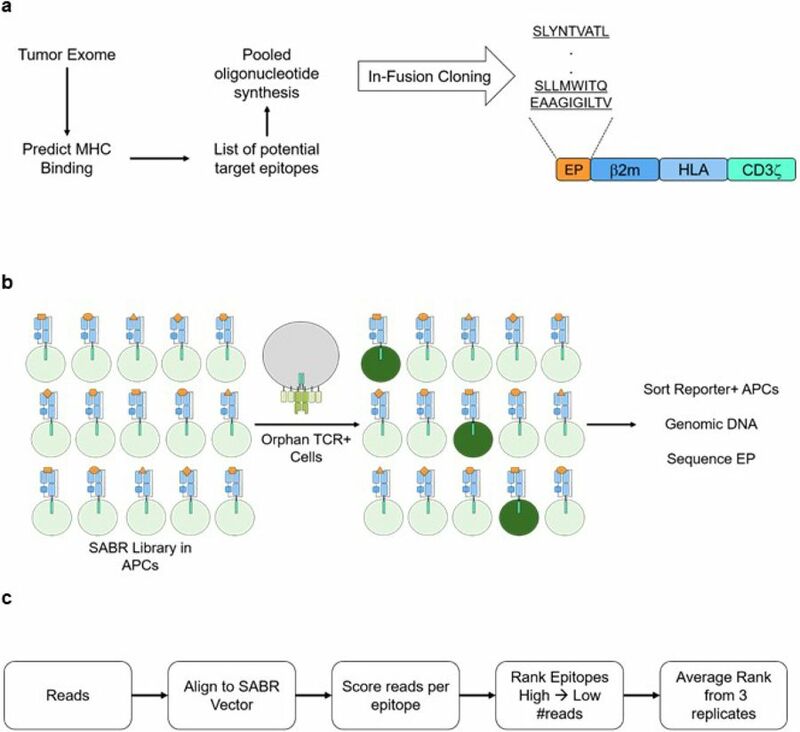 We devised a strategy for antigen discovery using SABR libraries to screen thousands of antigenic epitopes. 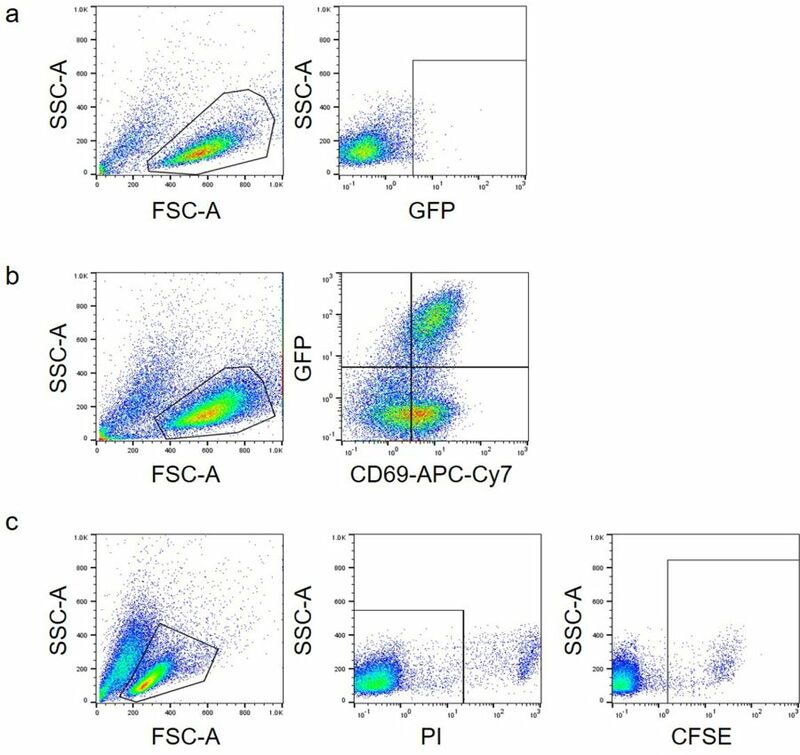 We validated this platform by identifying the targets recognized by public TCRs of known specificities. 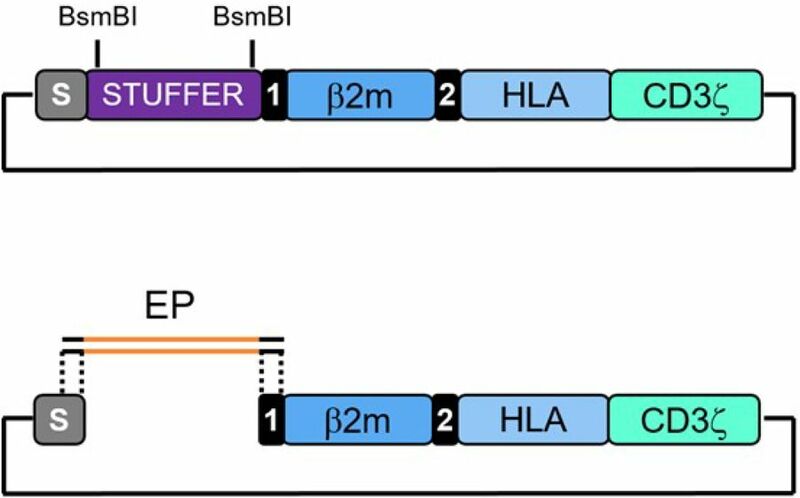 Moreover, we extended this approach for personalized neoantigen discovery. © 2019 Springer Nature Publishing AG. Received 02 July 2018; Accepted 07 December 2018; Published 28 January 2019. Data availability: The data that support the findings of this study are available from the corresponding author upon request. The raw data for Figs. 1–5 and Supplementary Figs. 1, 3, 4, 7, and 8 can be found in the Source Data files. The list of epitopes in the SABR libraries can be found in Supplementary Tables 3 and 4. The plasmids for HLA-A*0201-SABR backbone (pCCLc-MND-A0201-SABR-Backbone; ID 119050), HLA-B*2705-SABR backbone (pCCLc-MND-B2705-SABR-Backbone; ID 119051), A2-Mart1-SABR (pCCLc-MND-A0201-Mart1-SABR; ID 119052), and B27-KK10-SABR (pCCLc-MND-B2705-KK10-SABR; ID 119053) are available through Addgene. 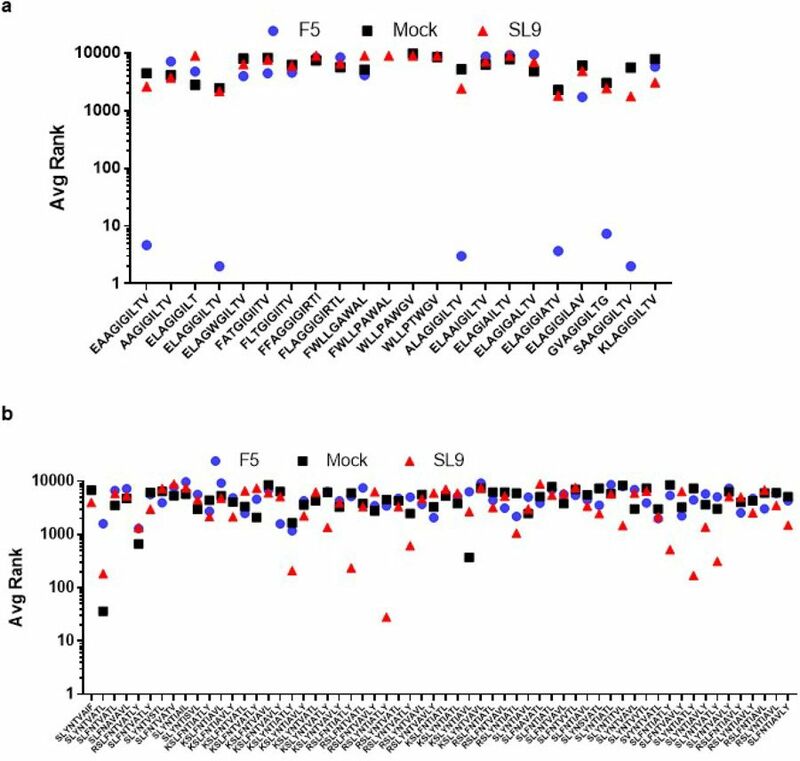 The sequencing data have been deposited in the Sequence Read Archive (SRR8207921, amplicon sequencing of A2-SABR-library co-incubated with F5 TCR; SRR8207922, amplicon sequencing of A2-SABR-library co-incubated with SL9 TCR; SRR8207923, amplicon sequencing of A2-SABR-library co-incubated with no TCR; SRR8207924, amplicon sequencing of A2-NeoAg-library co-incubated with neoTCR; SRR8207925, amplicon sequencing of A2-NeoAg-library co-incubated with no TCR). The code used to analyze sequences has been deposited in GitHub (https://github.com/Baltimore-Lab/nat-methods-SABR-trogo). We thank I. Antoshechkin at the Millard and Muriel Jacobs Genetics and Genomics Laboratory for Illumina sequencing, and A. Spalla at the Analytical Cytometry Core at the City of Hope for help with FACS. NFAT-GFP-Jurkat cells were a gift from A. Weiss (University of California, San Francisco, San Francisco, CA, USA) and Y. Chen (University of California, Los Angeles, Los Angeles, CA, USA). GXR-B27+ cells were a gift from B.D. Walker (Ragon Institute of Massachusetts General Hospital, Massachusetts Institute of Technology, and Harvard, Cambridge, MA, USA). J3 chimeric antigen receptor was a gift from P. Wang (University of Southern California, Los Angeles, CA, USA). The pCCLc-MND-X backbone and pCMV-RD8.9 were gifts from D.B. Kohn (University of California, Los Angeles, Los Angeles, CA, USA). MSCV-based shuttle plasmid was a gift from R.A. Morgan (National Institutes of Health, Bethesda, MD, USA). This work was funded by the California Institute for Regenerative Medicine (award DISC2-09123 to D.B. ), the Caltech Rothenberg Innovation Initiative (to D.B. ), and the US National Cancer Institute (grant 1U54 CA199090-01 to J.R.H.). Author Contributions: A.V.J. designed and performed experiments, analyzed and interpreted the data, and wrote the manuscript. M.T.L. designed and performed experiments, performed computational analyses, and interpreted the data. M.S. and J.D.J. designed and performed experiments, and analyzed the data. G.L., S.W., S.P., J.M.Z., and M.T.B. designed and performed experiments, and contributed reagents. J.R.H. and A.R. contributed reagents and supervised experiments. D.B. supervised the experiments, analyzed and interpreted the data, and wrote the manuscript. Competing interests: A.V.J., M.T.L., M.T.B., and D.B. are named as co-inventors on a patent application concerning the described technology. D.B. is a consultant of PACT and head of their scientific advising board. J.R.H. and A.R. are directors and consultants of PACT; M.T.B. and S.P. are employees of PACT; J.M.Z. is a consultant of PACT; and each of the foregoing individuals has equity interests in PACT.